The Basil Bee: The Basil Bee brings home Hailey! The Basil Bee brings home Hailey! Welcome home Hailey! Something furry will be joining me in the kitchen-our new addition to our family, Hailey, our lab/pit mix we rescued this past Saturday, April 30th, 2011 from The Last Resort Animal Rescue in West Milford, NJ!!! My hubby and I have been contemplating getting a pup and we decided if we did, that we would rescue one-and believe me there are so many great loving dogs out there. Ant loves Little Daddy (the brown pit therapy dog) on Cesar Milan’s show, “The Dog Whisperer.” He really wanted a pit and I wanted to also rescue. 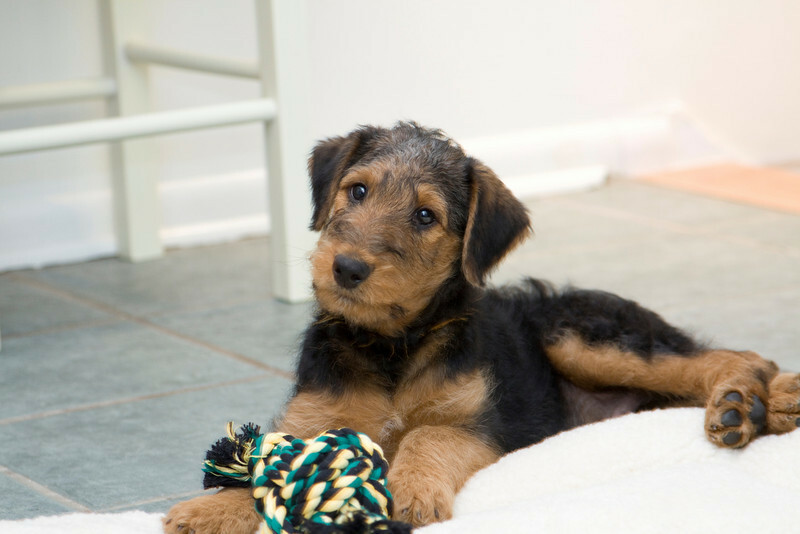 My sister Erin and brosef-in-law Kevin, recently brought home their own pup, Porter, ( he’s an Airedale Terrier-pictured below right) and they helped give us the courage to start our search even more. Hailey (her adopted name prior was Bailey) is a pit-bull terrier/lab mix who needed a loving home. She was brought to the TUSVM in Alabama, a small animal clinic at about a week old with severe frostbite to all of her feet and a tooth gash down her left ear, most likely from a dog bite. Due to the frostbite, she lost 2 toes on her back left leg but doesn’t seem to notice. She favors the other leg a little bit, but we see her strengthening every day! She’s about 13 weeks old, super friendly, and loves to snuggle. She soon then arrived to North Jersey and was in a great foster with foster parents, Karen and Norm, along with 4 other dogs (3 pits and a lab). She started to socialize in puppy school with Drayton Michaels/The Pit Bull Guru, and had a blast. Her foster mom brought her to work and to run errands so she became familiar and comfortable with all new things. She was so lucky to have such great foster parents that also crate trained her, housebroke her, and taught her a few commands! We love our Hailey! We spoke to a few rescue places and had our home inspected by Barbara, who lives locally and helps with placing pits in need of their fur-ever homes in the South Jersey area (and now a great friend of mine!). You would be surprised how many rescues there are in your area, and their mission is to reshape misperceptions regarding pit bulls, educate the public about what wonderful pets and companions pit bulls can be, and also serve as a source of information/referrals for pit bull owners, and ultimately reduce the number of pit bulls that are killed in shelters by promoting foster care, adoption, and responsible ownership. They are an absolutely wonderful family dog! They do need training, but let’s be honest, all puppies need obedience training no matter what! The key to raising puppies is also socialization. We have learned so much through the process that when we found Hailey’s picture online and made an appointment to go meet her, when we met, it was love at first site! So if you’re looking for a pit bull pup or any dog (no matter the age, size, type) for that matter, seek an adoption or rescue agency (just Google it in your area) and give your new addition their fur-ever home! 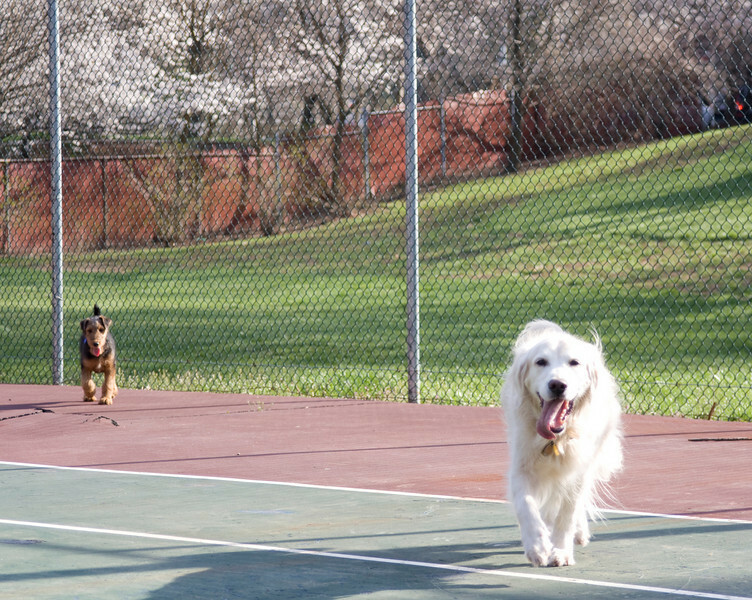 (left) Hailey playing with Barbara's dog Savannah! They look like mom and baby with their white socks on! And don't forget, if you're in South Jersey, the 5k at Cooper River Park, Saturday, May 14th..show your support for all the animals and meet beautiful Savannah (pictured above left) , this years mascot!!! I love this post! I also love Hailey! So happy for all that it worked out so perfectly and Savannah cannot wait for her next play date with little Hailey! !